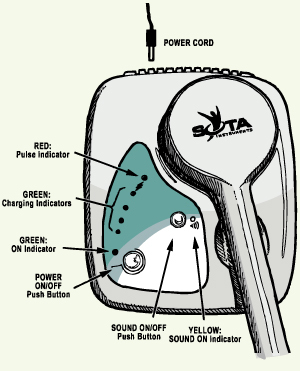 The SOTA Magnetic Pulser 5 Product Manual SOTA Instruments Inc. The Magnetic Pulser is a consumer product designed to be used as part of a Wellness Lifestyle. A commitment to healthy lifestyle choices is an important factor in the journey to Wellness. The SOTA Magnetic Pulser offers the benefits of a pulsed magnetic field to help balance the body's natural electricity for health. The Magnetic Pulser is designed to be used independently, but can also be used together with any of the SOTA Products. With proper care, your Magnetic Pulser should provide you many years of trouble-free use. Please read this manual thoroughly before using your Magnetic Pulser. This is the most up-to-date manual. Do not use with a pacemaker. With the permission of your physician, it may be safe to use below the waist. In the area of an implanted device such as a shunt, etc. In the area of external or internal bleeding wounds, including menstruation, as Pulsed Magnetic Fields may increase blood flow. In the area of a metal implant. The metals may absorb heat and could cause discomfort or a burn. Metal dental fillings are rarely affected. It is possible that using Pulsed Magnetic Fields can mask pain. It is wise to consult a health practitioner to determine the cause of the pain. In very rare instances, individuals with neuropathy-related nerve pain have reported an increase in pain when using the unit. If you experience nerve pain or an increase in nerve pain while using the unit, please discontinue using in the area of pain. While the science is inconclusive, the South (+) polarity may stimulate. For this reason, we suggest not applying the South (+) polarity side of the Hand Paddle to any condition where stimulation may be harmful. The South (+) side of the Hand Paddle has the SOTA logo. When in use, please ensure there is proper airflow around the head of the paddle. With normal use, the Hand Paddle will become very warm to hot. If it feels uncomfortable, turn the unit OFF and allow it to cool before resuming use to prevent a skin burn. To prevent damage or loss of information, keep away from homeopathic remedies, credit cards, security cards, audio and video tapes. Also from electronic equipment—computer disks, hearing aids, cell phones, answering machines and others. GREEN: Indicates the unit is ON and the pulse is building. RED: Indicates the pulse is being released. YELLOW: Indicates the Sound Option is ON. Insert the power plug from the AC-DC Wall Adaptor into the unit and plug the adaptor into an electrical outlet. Push the ON/OFF button. All the lights will flash in sequence to indicate the unit is ready for use. The GREEN lights indicate the pulse is building. The RED light will flash each time the Pulsed Magnetic Field is released from the Hand Paddle. A click may or may not be heard as the pulse is released. Sound Option: To hear a beep each time the magnetic pulse is released, push the SOUND button. The YELLOW light will indicate the Sound Option is ON. The head of the Hand Paddle should be located on or as close to the body as possible. It does not need to touch the skin as clothing will not interfere with the magnetic field. Note: The Pulsed Magnetic Field penetrates up to nine inches. 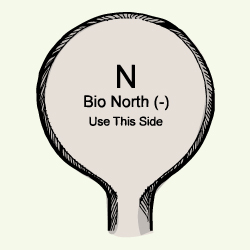 For most applications, use the side of the Hand Paddle marked Bio-North (-) against the body. When a cycle finishes (approx. 20 - 30 minutes) the unit will beep. To continue with another cycle, push the ON/OFF button within 20 seconds of the beep. The unit turns itself OFF if the ON/OFF button is not pushed within this time. To turn the unit OFF before the end of a cycle, push the ON/OFF button. Unplug the Wall Adaptor when not in use. Most individuals will not feel any sensation while using the Magnetic Pulser. With normal use, the Hand Paddle will become very warm to hot. If it feels uncomfortable, turn the unit OFF and allow it to cool before continuing. Another option is to place something between you and the Hand Paddle, like a single layer of towel or blanket, always ensuring there is proper airflow around the head of the paddle. A faster option – use an ice pack or two. Cool your paddle off by applying an ice pack to the paddle face (you can even apply two – one for each side of the paddle). The face of the Hand Paddle is brought back to a comfortable temperature quickly and efficiently. 20 - 30 minutes to two hours or more. Length of Use: When used as part of a Wellness Protocol, daily use for many weeks is more important for results than using occasionally. For specific purposes, longer and more frequent sessions may be more beneficial. Generally, the Magnetic Pulser can be used as needed. Placement: The Hand Paddle may be kept on one location for one or more cycles. It may also be moved at any time to a different location. Stop Gradually: Reduce the amount of time each day for the last week of use. If using more than one SOTA unit at a time, it is suggested to stop only one unit at a time. To operate the Magnetic Pulser from a 12 Volt DC source, such as an automobile battery or an appropriate Solar Panel, purchase a Universal Power Cord with Tip or Center Positive. Magnetic Field Intensity: Greater than 6000 Gauss at face of the Hand Paddle as tested with an F.W.Bell 5080 Tesla Meter. Pulse Duration: ~2.5 mS (milliseconds). Pulse per Cycle: 255 pulses (approx. 20 - 30 minutes). The Troubleshooting Guide is a great tool to check if you are experiencing any issues with your unit. The manufacturing of the SOTA Products are a global collaboration. The following countries participate in the making of the Magnetic Pulser (listed in alphabetical order): Canada, China, Hong Kong, Malaysia, Mexico, Taiwan, Thailand and the USA. The Magnetic Pulser Model MP5 is covered by a two (2) year limited warranty. Please keep proof of purchase. Warranty is void if the failure is due to abuse or negligence. SOTA reserves the right to make changes to the Magnetic Pulser without obligation.